Spoiler alert, watch the funny interview with E! News reporter Ryan Seacrest before continue reading. Ryan Seacrest in Burberry suit interviewing comedian Sacha Baron Cohen, who appeared in uniform, carrying the fake ashes of Kim Jong-il, and with a brigade of female bodyguards in tow. *lol* I love the stunt of Sacha Baron Cohen and how he managed to appear in uniform on the Red Carpet. Before the Oscars there was a controversy between him and the Academy, who first wanted to ban him from the Oscars, but finally agreed to let him come as General Aladeen, as the character of his upcoming movie The Dictator, if he changed clothes and wore a black tuxedo for the Oscars ceremony, but Sacha later preferred to go to Vanity Fair's viewing party after his stunt. Sacha was also one of the leading characters in the film Hugo, playing the awkward and funny station inspector. Was his prank on Ryan disrespectful? In my opinion, no, it was not too disrespectful (he did not spill the ashes on another artist or on a dress that is hard to change or clean, for example) and Ryan also reacted in a cool manner. After all this is the show business and Sacha did what everybody else was doing on the red carpet, promoting themselves and their movies. 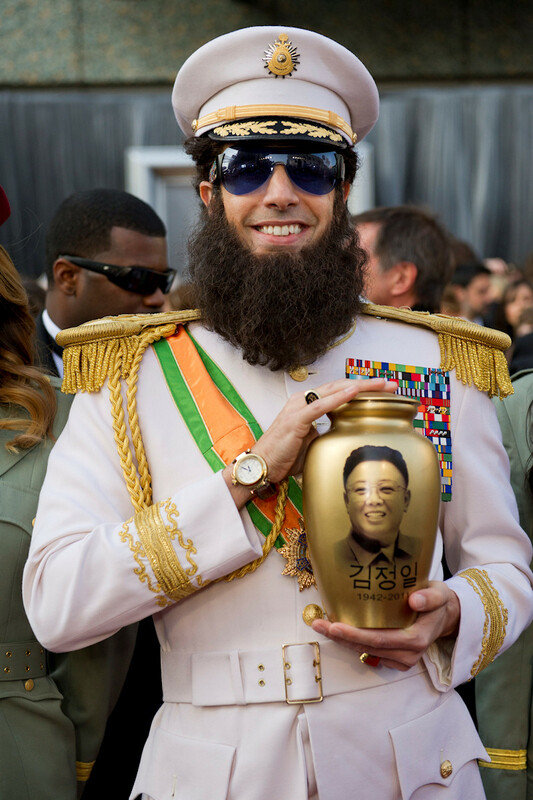 Sacha Baron Cohen as The Red Carpet Dictator. How do you like Sacha's red carpet stunt?